Ruling would make tens of thousands of overnight felons, despite previous ruling that there is no legal means of regulating the firearm accessories. Yesterday, AG Jeff Sessions issued the first step toward a new round of gun control through a Notice of Proposed Rule Making (NPRM) that would classify bumpstock-equipped firearms as NFA-regulated machine guns. Although it has not yet been published in the Federal Register for the required public comment period (which will, inevitably, be disregarded by the administration), the text of the NPRM is available online. 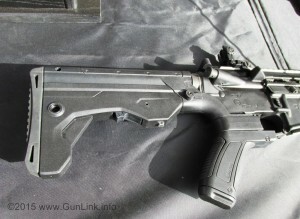 Those interested can discuss the existing and proposed bumpstock legislation on the GunLink forums. The text of the relevant portions of the NPRM are shown below, from pages 53-55, along with images of those pages. This NPRM shows a blatant disregard for Second Amendment protections, as well as a fundamental ignorance of how the devices work. Shortly after the NFA rules went into effect, attorneys for the United States argued before the Supreme Court that “The Second Amendment protects only the ownership of military-type weapons appropriate for use in an organized militia,” while (incorrectly) stating that a short-barreled shotgun does not meet that definition. Further, the mechanism of how bumpstocks work DOES require one manipulation of the the trigger per shot fired. A user cannot simply pull the trigger and achieve continuous fire, as they would with a machine gun. Subsequent shots are achieved by manipulating the trigger with the support hand by pulling the trigger forward into the trigger finger instead of the traditional method of pulling the trigger rearward with the trigger finger. Once this NPRM is published for public comment, it is important to file your comments to oppose this disturbing piece of legislation. In the wake of the awful terrorist attack carried out on concert-goers in Las Vegas, a local firearms playground issued the statement below, throwing the Second Amendment under the bus in favor of increased regulations on law abiding citizens. We find this statement to be reprehensible and 100% counter to the words and intent of the United States Constitution and the Second Amendment contained in the Bill of Rights. The Second Amendment protections of the right to keep and bear arms is not intended to protect The People’s ability to hunt, or to goof off with rented firearms that they view as “toys” on gun a playground out in the desert. Likewise, as we have seen time and time again with various attempts at regulating behavior through the regulation of goods, restrictions on those protected rights would not, and could not, prevent madmen from carrying out their twisted agendas. Good for them for shutting down for a couple of days out of respect for the victims and for promoting blood donation. Good for them for making a “private” monetary donation to a victims fund (that they boast about in a press release). But pushing for tighter restrictions, testing requirements for gun owners, mandatory sentencing, and increased regulation? Congratulations on getting a few minutes of the spotlight by jumping into the media frenzy on this news cycle’s topic du jour, and enjoy the lasting effects of trashing the very mechanism that (barely) allows you to operate your business. On behalf of MGV, we are deeply saddened for the victims and families affected by last night’s activities and absolutely sickened by the behavior of the individual who committed a sheer act of violence on our community. We realize there will be many sensitivities to firearms and their misuse, and we would like to address a few points as a business that offers firearms experiences in a safe, controlled environment in Las Vegas. We believe, as we always have, that there should absolutely be more stringent control on the types of firearms private individuals can own and the processes they must go through in order to own those firearms. There were many factors contributing to this tragic event, but there is no doubt that the shooter’s ability to inflict so many casualties was heavily due to the types of weapons he had access to. MGV agrees that the NRA, Federal Government and individual states have a responsibility to continue to maximize efforts to keep these firearms out of the hands of the wrong people. We believe that responsible gun ownership is attainable through the application of common sense, more stringent vetting and background checks, dramatically increased mandatory sentencing for gun offences and increased testing standards for gun owners. In light of the recent tragedy, Machine Guns Vegas feels it’s inappropriate to be open today (10/2) and tomorrow (10/3) in respect for the injured, lives lost and families affected by this senseless act. MGV has refunded all customers who have made reservations on 10/2/17 & 10/3/17. MGV’s parent company, The Compound LLC has also made a private donation to Clark County Commission Chair Steve Sisolak’s Las Vegas Victim’s Fund GoFundMe Campaign in an effort to assist those in need. A portion of proceeds following our closure today will benefit The Las Vegas operations of United Blood Services, a Blood Systems blood center, which provided blood and blood products to area hospitals treating victims of the Oct. 1 concert shooting. United Blood Services continues to assess the needs and stands ready to support hospitals with ongoing blood product needs. To schedule a blood donation appointment, please visit www.bloodhero.com.